SnipDock is a simple screen capture tool that helps to capture desktop screen and lets you save screenshot automatically to PC. It is a good replacement for default PrintScreen key, because it can capture a specific region and automatically save captured screenshot in jpg format to Pictures folder. Thus, you don’t have to use any image editor software to paste screenshot, and then save to PC. Captured screenshot can also be previewed on its interface (named as dock), just like visible in screenshot below. It is lightweight, very easy to use, and available absolutely free. We have reviewed some other software that helps to automatically capture screenshots: MultiScreenshots, Auto Screen Capture, Clicktrace, and AutoIt Windows Screenshooter. How To Use This Free Screen Capture Tool? Download the installer file of SnipDock by accessing its homepage and start the installation wizard. Homepage link of SnipDock can be found at the end of this review. Microsoft .NET Framework 4 is required to work with it without any problem. Follow the simple steps of installation wizard and complete the installation. After this, a desktop icon will be available to run it. While running it for the first time, it will be available at left side of your desktop screen. If you want, you can change its position to right or can use float option. One unique thing about this screen capture tool is that its place remain fixed. So if you have opened its dock type interface on left side, then that area will be reserved for this freeware only, so that you can use it to capture screenshots quickly. To capture a screenshot, use Snip Screen button, and select area on desktop screen. After this, selected area will be captured and saved automatically in jpg format to Pictures folder present in Library. Also the preview of captured screen will be visible to dock (if Snips go to Dock option is enabled). 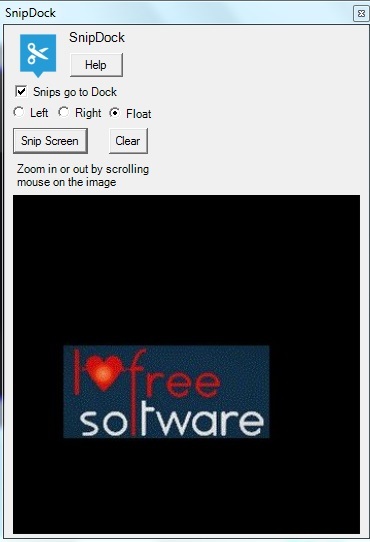 It doesn’t matter how large is the screenshot, SnipDock adjusts its interface according to captured screenshot, and lets you preview the original image. Or else, you can simply use mouse wheel to zoom in/out the interface to preview the screenshot. SnipDock is simple yet useful freeware, if you need a replacement for PrintScreen key. Its flexible interface makes it useful enough to clearly preview captured screenshot. However, there are many feature rich screen capture software available that provides built-in image editor to enhance captured screenshots. 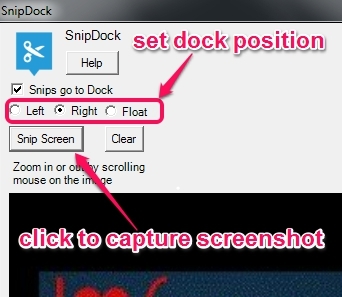 If you need a simple screen capture tool, then SnipDock could be useful.